Welcome to Northfield Community Curbside Composting! Sign up today to recycle organic waste from your home! So that we can turn waste into soil! Curbside Composting is in Northfield and Surrounding Areas! Start turning your scraps into soil. Sign up by subscribing at the bottom of this page. You will receive a 5 gallon bucket and compostable bags. Each week, fill your bucket with organic waste. Food scraps (including meat and dairy), soiled paper, and yard waste are acceptable. Once a week, we will pick up your waste and give you a new bag. Your organics come with us- we’ll do the composting! Some frequently asked questions about composting, and why it's good for our community. Why is composting good for the earth? According to the EPA, as a country, we throw out more than 250 million tons of stuff every year. More than half of this goes into landfills. 28% of that waste is food scraps and yard waste that could be composted. But, only 8% of it actually is. Meanwhile, more than two thirds of our organic waste goes into landfills, where it releases methane, a greenhouse gas more harmful than carbon dioxide. Composting keeps waste out of landfills, but the benefits don’t end there. Adding compost to soil adds nutrients, reduces erosion, and improves soil structure. This means farmers don’t have to add as many chemical fertilizers, and can worry less about soil loss. Composting is an easy way to support sustainable agriculture, and turn your food back into food! Why is composting good for our community? Landfill: The landfill is filling up! We want to divert as much waste as possible so that we extend the life of our landfill. As we mentioned in the previous section, a significant portion of waste that goes to the landfill is actually compostable, causing landfills to grow at a faster rate than necessary. Local Jobs: This is a locally run collection service with an emphasis on employing young people at living wage standards and empowering them through team decision making and management. Local Soil Fertility: In start up phase, we will be bringing the compost to an industrial facility in Shakopee. As the business scales, we plan to process the compost locally to be made available to local farmers and gardeners. $7 per month ($84 per year). You can add an additional bucket for $3 per month ($32 per year) using the sign up form or by emailing us at northfieldcomposting@gmail.com. Service starts the week after you subscribe and continues all year round! If you always keep a lid on your containers, you will not suffer from any bad smells. We also recommend rinsing out the small container after you dump it. How often do you pick up my compost? Once a week, on Tuesdays. Will you pick up compost from my house? We currently collect from Northfield, Dundas, and the surrounding area. We are happy to accommodate rural subscribers-send us an email if that’s you and we’ll work something out! What is the difference between organics recycling and composting? Organics recycling and compost are two terms that can be used interchangeably, but in technical terms organics recycling refers to the material that is collected and compost refers to the product of the process. No, this program is totally voluntary! We will provide you with one bag for your bucket each week. You can purchase extra bags (sold at Cub or Just Food Co-op), but please ensure that they are compostable. At this time, we can only accept as much yard waste as you can fit in your compost bucket. Our waste hauling license prevents us from picking up extra waste in any container other than our buckets, so please don’t put them out on the curb! However, you can dispose of additional yard waste a few different ways, details can be found at the City of Northfield website. 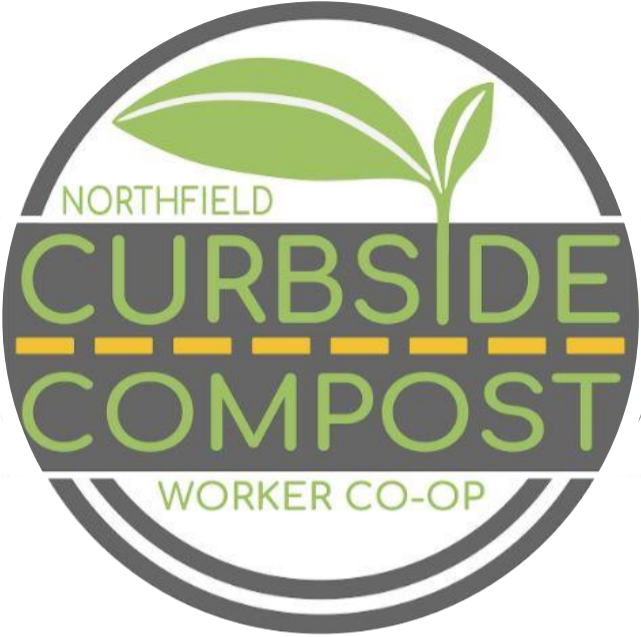 Northfield Curbside Composting is a group of passionate young people dedicated to finding local solutions to environmental and social issues. Our mission is to reduce waste filling up the Rice County landfill and lower local greenhouse gas emissions, while creating quality local jobs and providing an excellent service for our customers! We launched in July 2017 with help from Natalie Slinger and Amelia Ousley. Helen Forsythe was born and raised in Minnesota. She has been interested in soil health and agriculture ever since her first farm job at age 14. Her experience in diverting waste from the landfill goes back to the 9th grade, when Helen and some of her classmates welded recycling bins that continue to reside in downtown Northfield, where there had previously been only trash bins. Cliff Martin was born and raised in Northfield MN. He works as an organizer with Young Peoples Action Coalition organizing high school students across MN. He is starting sustainable farm in the spring of 2017 and works as a cooperative business developer on the side. He loves Star Wars, anything Star Wars. Bailey Shatz-Akin is a Minneapolis native and recent Northfield transplant. They love answering your emails and picking up compost on warm, sunny days! Since childhood, they’ve been excited to learn about the science behind environmental problems and solutions. In their free time, they’ll be crocheting or going for long bike rides. Grace Brosnan is from Mankato and grew up composting in her backyard. She was confused when she learned not everyone else composted, and is excited to bring composting to the people as a worker-owner at NCC Worker Co-op! Annual payment, pay it all once, now. Instead of paying once per month, pay $84.00 up front for a whole year of service. If at any point you cancel your subscription, we’ll pay you back all of the months we didn’t serve you for the year with no cancellation fees or other costs. This is our preferred method of subscriptions as it lowers our transaction fees we pay for online payment services and is the easiest option for simple payment for subscribers. Monthly payment, for your subscription, we take $7.00 per month from whatever card you set up your payments on. Each transaction has a fee involved (on our end, no cost to you) so we prefer that subscribers pay for the whole year up front, but if that does not work for you, that’s totally alright! We want this service to work best for you. You can pay online via credit card with the form below or pay by check. Is the cost of our service well within your means? Make a small monthly donation or a single amount to help us offer accessible curbside composting to all! We are people who love community, curbs, and compost. Website designed by Malcolm Mitchell, Sam Neubauer, and Brent Murcia. Contact: mitchellm@carleton.edu. Photo credits (#1 in slider): Wikipedia users 123dieinafire. COPYRIGHTS © 2015 KodeForest All rights reserved.